"Now here, study this map closely. We start here at Jerkola, go down the Inseine River, over the Giva Dam, through Pushover to Shmowland, to the stronghold of Schow." 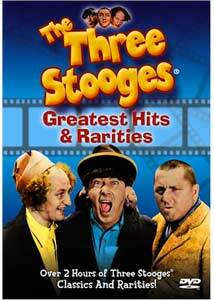 Anchor Bay weighs in with the first of two Three Stooges discs. Unfortunately, the principal contents of this disc are the same four public domain Stooges shorts that have been put out on countless other VHS and DVD labels. There are, however, some worthwhile additional materials. Sing a Song of Six Pants (1947) finds the Stooges as Pip Boys, tailors and cleaners, specializing in "cleaning, pressing and altercations." Terry Hargan (Harold Brauer) is a bank robber on the lam, and when he masquerades as one of their store dummies, they strip him of his clothes. They find a safe combination in the pocket, and Hargan and his moll (Virginia Hunter) will stop at nothing to retrieve this information needed for their next job. Pretty tame, with one eye poke, three slaps and one blow to the head. One of the great Curly shorts, Disorder in the Court (1936)—the first to spell Curly's name right—is up next. Dancer Gale Tempest is on trial for the murder of Kirk Robin, and her defense rests on the testimony of three nutty witnesses. Before you know it, there's gunplay in the courtroom as well as shenanigans with a bull fiddle. The great routine where Curly is being sworn in is a classic of comedy and even after countless viewing still merits a hearty laugh. An excellent piece of work with three eye pokes, four slaps and nine conks to the noggin. Moe, Larry and Shemp are in a Middle Eastern palace, trying to act as cooks with predictable results in Malice in the Palace (1949). When they find out about the theft of the valuable gem of Rootentooten, they go after it into a rival palace in the stronghold of Shmow, disguised in Santa Claus suits. The whole thing is quite surreal and not only has an eye poke and a dozen slaps, but a full ten blows to the bean. Brideless Groom (1947), features Shemp as a music teacher. In another staple situation, Shemp is set to inherit half a million dollars if he gets married within seven hours. Of course, the women Shemp knows reject him before he can mention the money, until they find out and all show up at once at the justice of the peace. The violence here is almost entirely on the part of the women, who mercilessly take on the Stooges and give them what for. One conk on the head, but plenty of other mayhem here. This is one of the funniest Shemp shorts, and gets play in The Evil Dead, among others, with the justice of the peace's repeated and futile pleas of "Hold hands, you lovebirds." Then we get to the good stuff: A 1950 appearance by Larry, Moe and Shemp on Ed Wynn's television series Camel Comedy Caravan is presented in its entirety. Here the boys are CBS network executives, by the names of C, B and S. They predictably wreak havoc, tearing up the scenery and wrecking everything in sight. They're in fine form, and make excellent foils for Wynn's whimsical verbal style. In fact, this episode makes one yearn for a release of more of Wynn's work, but only for those with a high tolerance for punning. Particularly notable is the inclusion of a lengthy ad for Camel cigarettes at the center of an extended skit, something utterly unthinkable today. Three eye pokes, eight slaps and one conk on the head. Several very early shorts wrap up the package. The 1934 Knife of the Party is a crude two-reeler featuring Shemp Howard and his four Stooges (none of whom are the regular cast), in a period where the ownership of the Stooges concept was in some dispute between Ted Healy and ex-members of his troupe. Shemp is the best thing about this short, but he gets precious little screen time, with others taking center stage in a story about a vaudeville show being forced to work off their hotel bills. There's altogether too much insipid singing and lame humor here, but it's an interesting historical document. Finally, there's the 1933 Hollywood on Parade (05m:02s) short featuring Ted Healy along with Larry, Moe and Curly (with a head of hair). The other day I read about the new Stooges biography that reveals Healy was allegedly murdered in 1937 by Wallace Beery and one of Lucky Luciano's gang, and that got me to wondering if there was any surviving material of Healy with the Stooges. And here comes this in my review queue! It's easy to see why the boys left Healy; he's clearly not pulling his punches at all and really slapping them hard. They're only on the screen for a minute or so, but it's still intriguing. Jimmy Durante has the prime spot, singing I've Gotta See a Man About a Dog. Image Transfer Review: Since these are public domain shorts, one doesn't expect them to look good. But these four look truly terrible. Some of them are television print and may be cut short, and they all are blurry, badly damaged and hard to watch. Black levels on Six Pants are a vague greenish-gray; the black levels are better on the other shorts, but only because the contrast is far too high, blowing out all of the detail in everything that isn't black. Six Pants also has aqua and red vertical lines running through part of the short. The Wynn program suffers from frequent video dropouts. The 1930s shorts don't look good at all either, as if they're taken from a video master rather than film. In all, this is one of the worst looking Anchor Bay discs I've ever seen. Audio Transfer Review: Unfortunately, the sound is no better. Plagued with hiss and noise throughout, several of the shorts also feature a loud burring under dialogue that I found to be highly unpleasant. Music is terribly distorted and tinny, which isn't unexpected for the early 1930s material, but shouldn't be the case for late 1940s pictures. 2 Other Trailer(s) featuring Have Rocket, Will Travel and Stop! Look! and Laugh! Extras Review: A few additional extras round out the package. The best of these is an ad done for Simonize in the 1950s. Though blurry and dupey, it's still pretty funny with one slap. A gallery of about 40 stills plays over snippets from the soundtracks to the shorts. Many of them are from the days with Ted Healy, when Larry still had most of his hair. A couple trailers from a Curly Joe vehicle and the compilation Stop! Look! and Laugh! conclude the package. The Wynn program and Knife of the Party are chaptered, but none of the other materials are. Anchor Bay trots out the four public domain shorts, in terrible condition, and tacks on some material that's probably interesting only to Stooge devotees. Unless you're hungry for everything Stooge-related, save your money for Columbia's releases.